Hello friends! TGIF!! This week has been a blur. Hubs has been working nights and going to school in the mornings. I'm exhausted and feeling a little burned out. I don't know how it is possible, but life seems to move at an ever-quicker pace around here. I feel like I'm just trying to keep my head above water. At any rate, here's one of my favorite photos from this week. Little Miss is looking so grown up. I really wish she'd slow down and stay a baby a bit longer. Being a grown up is so over-rated. What have you captured lately? Thanks for stopping by today. Have a great weekend!! I saw one of my gardenias blooming and I remembered you and your post where you said you enjoy yours very much. Had to stop and tell you that I am starting to enjoy mine too. She is adorable and you know even when she's all grown and adult, she will still be your baby. :) You too have a great weekend! Look at that hair. She is so beautiful. She looks so much like her sister. 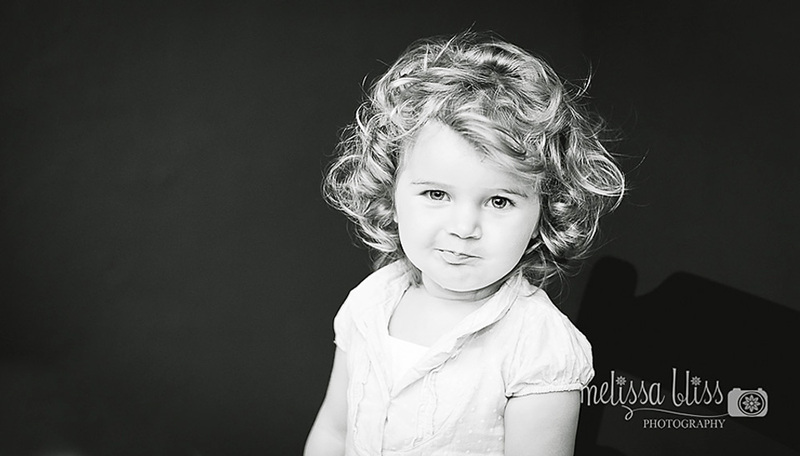 I just love that little smirk on her face (as if she wasn't cute enough) or something ;o) Awesome capture! It looks fabulous in black and white and I always love your conversions! Awe! She looks so adorable! I love her look! She has this "Yeah, you and what army" look!